Rowena Fischer Meeks Abdy (1887-1945) she was born in Vienna, Austria to American parents she was the daughter of John Meeks (1840-1891), a retired wealthy American business man originally from New York and Anna Fischer Meeks (1860-1898). When she was 11 years old the family moved to San Francisco. 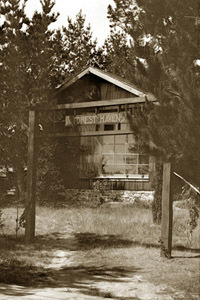 Her early education was at St. Margaret's School for Girls, San Mateo, Calif. She was an American painter who flourished in Northern California in the early 20Th. century. Working in oil, watercolor and charcoal, she achieved prominence in the plein air painting school and her works are held in several permanent collections of significant museums. And exhibition at the art gallery at the Hotel Del Monte, Monterey, San Francisco Sketch Club, Carmel Art Association, San Francisco Art Association and a number of others. 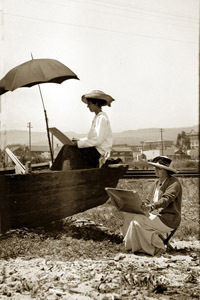 She had significant interactions with other famous California artists such as Arthur Frank Mathews and Armin Hansen:. She proved motivated as a young girl and enrolled in the Mark Hopkins Art Institute in her early teens. There she studied under Arthur Frank Mathews (1860-1945). In 1910 she was living with her step-mother Helean Chambrain at 2996 Jackson St. San Francisco. She married writer Harry Bennett Abdy (1868-1963) on October 9, 1910 in Monterey, California he was born in Yorkshire, England the couple built two home's in Monterey the first on El Dorado shortly after their marriage and home/studio "Forest Haven" around 1912 on El Camino in the Pines above the thriving art colony of Monterey. Late in 1915 the couple took a trip east and traveled with friend and fellow artist Armin Hansen on a riverboat up the Ohio River and in 1919 Harry Bennett Abdy published a book with illustrations by his wife On The Ohio published by Dodd, Mead and Company. In Monterey where she studied with her close friend from art school Armin Hansen (1886-1957). Lillie May Nicolson (1884-1962), E. Charlton Fortune (1885-1969) and Lester Boronda (1886-1953). In September of 1917 they sold "Forest Haven" and moved to San Diego ware she rented an apartment over looking the bay with stately Point Loma, where her fondness for Spanish architecture. Traveling around California in a large sedan that she had converted into a studio, she could sketch in comfort and privacy she traveled from Death Valley to Yosemite Valley. She had a studio at 728 Montgomery Street, San Francisco in the early 1920's. By 1921 they bought a home at 1050 Lombard Street, on Russian Hill in San Francisco. She and Harry made a trip on the S.S. Roma to Italy in June of 1927. They were divorced in late 1927 and he was living in Los Angeles in the 1930's and died in Pinellas, Florida in 1963. 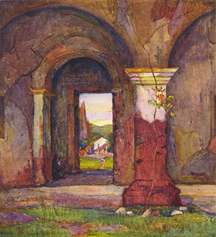 In 1924 only 400 copies of Old California with ten color reproductions of original watercolors by Rowena Abdy was published by John Henry Nash (1871-1947) of San Francisco and with a foreword by Gottardo Piazzoni. In June of 1929 she traveld by passenger ship to Italy. 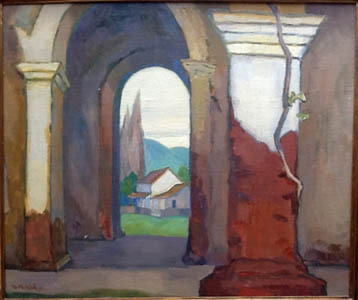 In the spring of 1934 she exhibited her works at the Valdespino Gallery, San Francisco, in 1936 at the Delphic Galleries, New York City. On June 25Th. of 1937 she made a trip to New York on the S.S. Santa Rosa arriving in New York on July 14 and then on to Italy returning on the passenger ship Rex from Genoa, Italy arriving back in New York city on Sept. 23rd of 1937. She remained in San Francisco until her death on August 18Th. of 1945. Subject in the collection are Old Monterey Adobes, The Robert Louis Stevenson House, Old Washington Hotel, Old Monterey Cemetery, Monterey Fisherman's Wharf Carmel Mission, Point Lobos, Jolon, Castro Adobe, San Juan, San Juan Bautista Mission, Lake Tahoe, Santa Barbara Mission, other California Missions, San Diego, 1915 Panama-Pacific International Exposition, San Francisco, Belvedere, Bolinas, Sausalito, Marin County and the San Francisco Bay area. about 570 +/- film negatives 3 1/4 x 5 1/2 inch postcard size exposures on #122 roll film. Kodak Folding Pocket Camera, producing 8 exposures per roll. 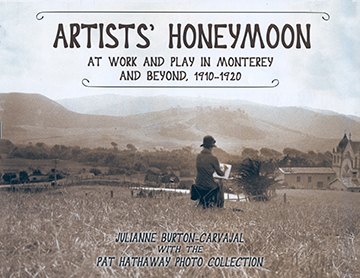 Artists Honeymoon: At Work & Play in Monterey & Beyond, 1910-1920 (4 parts, 140 pages, 160 photo in Sepia and full color) This unique window onto the history of Monterey and environs features 150 century- old photographs. Never before published, they have been selected from a recently rediscovered trove of 570 negatives now in the Hathaway archives, and supplemented with associated paintings and period maps. Text by Julianne Burton-Carvajal with images by the Abdy's from the Pat Hathaway Photo Collection. CV # 2012-018-0001 / 50? Holdings: over 27,977 of Monterey County listed in our database.